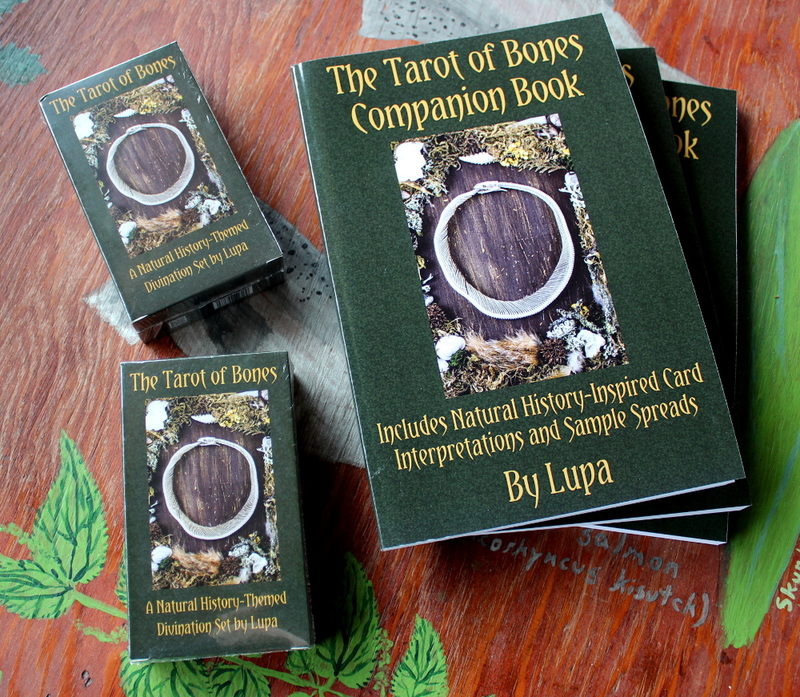 Lupa (artistic alter ego) is the creator of Tarot of Bones and no newbie to divining with bones. 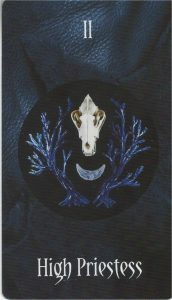 Several animal skulls in her home are considered ancestors and she also creates art with pieces of animal skeletons. Her intensive work with animal totems and spirits is, says the introduction in the companion, what helped her find the right match for each card. 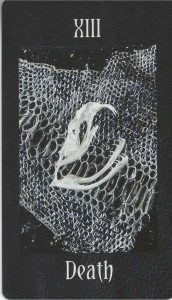 That companion, which comes in paperback or ebook and needs to be ordered separately (beware: there is no LWB), is an important key to understanding the Tarot of Bones, since it is so deeply inspired by natural history. 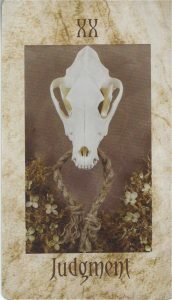 There are no human events and symbols (as most tarot decks have), so getting a grip on animalistic symbolism is a must. Yep, one of those…a study-deck as I like to call them. But, if you want to use a bone-deck my guess is you either already know your stuff or are eager to find out. It’s a black & white guide, in the paper and digital edition. And I liked it! Most of the guide is a card by card explanation, in a refreshing way. This companion really shows the inner works *and* the inner creator. 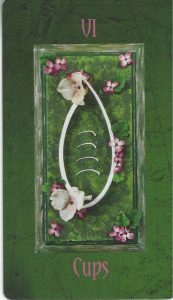 For every Bones-card you get how the essence of the Waite-Smith led to bone-type, materials used, and the arrangement. 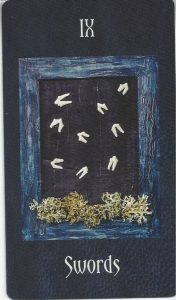 It also tells you how her personal relationship with tarot influenced the creation of this deck and how it’ll read. And that’s just “My inspiration”, the description. In most cases (like with the 5 of Wands) it already tells you more about the card than some companions (LWB’s) do in their entire meaning section. 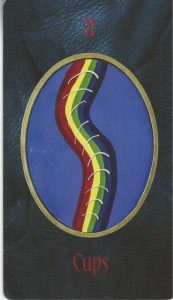 The meaning paragraph(s) in the Bones-guide reads as a story from an I-perspective, pointing out every day events, personality fails and fortunes, in the context of this card in a reading. 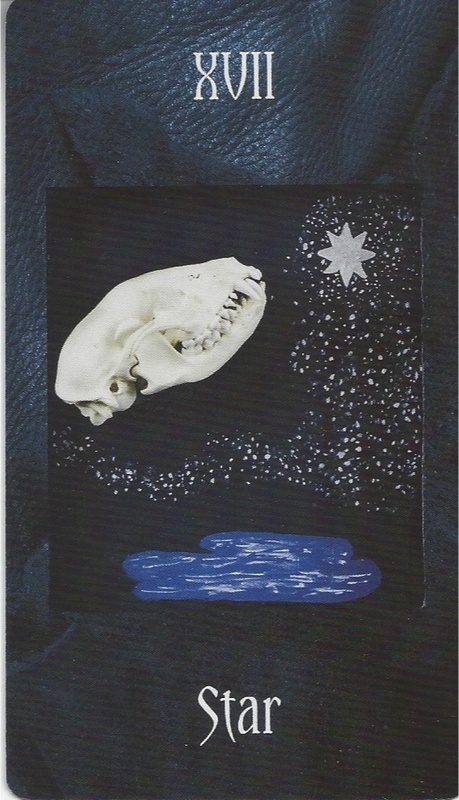 If the book is indeed indispensable in order to work with the Tarot of Bones at first, it is at least a worthy read. Moving on to the actual physical cards…(Yeah, yeah, took me long enough). The Tarot of Bones comes in a regular tuck box; green with the print of the Magician on the cover. The back of the box describes the deck and you have your copyright notices. The card stock is… acceptable. It is like most card stock nowadays. Flexible enough, but not luxurious. To some a disappointment, to others…well, what they’re used to. At least there is no annoying super gloss or stickiness. 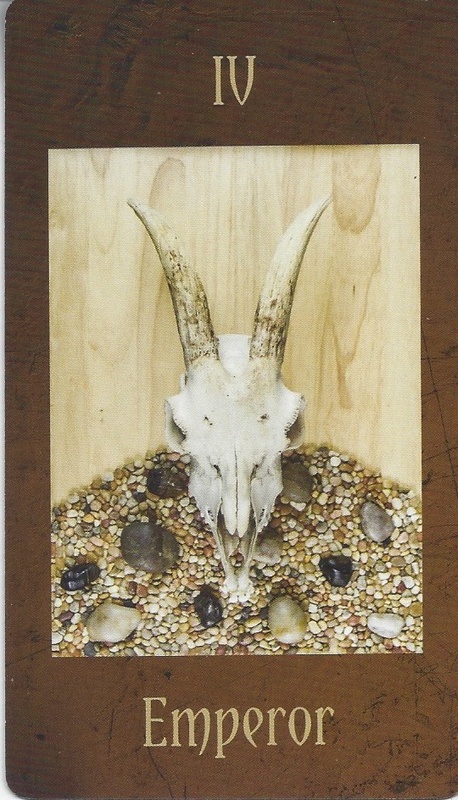 The cards aren’t painted, but each minor and major arcana is a photograph (made by Sandra Swan) of an assemblage of bones and natural materials. 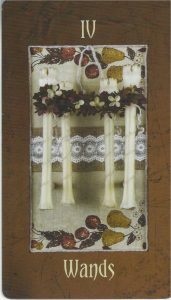 The cards have roman numerals and titles (III The Empress, VIII Pentacles). A little to my surprise there wasn’t a link to the elements, so the colors of the titles won’t help you one bit in deciphering which bone construction is what suit. Because these are assemblages and arrangements, obviously we can’t speak of true scenics. No human symbols, remember (see table). The deck is a pip-deck, meaning you need to come up with your own way of reading the minors – as well as a lot of Majors by the way. It is, other than a very straightforward answer, also an excellent example of the variety of this deck when it comes to the art. See how colorful it is? Something a little unexpected for a bone deck. While the *expected*white, brown and green do come up frequently, Lupa definitely made use of every color available to nature or the printing industry. In this case we recognize The Sun for what she is. With cards like Judgement, Hanged Man and several others that is quite difficult – no beginner’s deck here. The Sun is luckily in the company of The Devil, Emperor, Magician, Star and Moon – those cards were obvious. Either through background, use of color or even use of bones and skulls. Speaking of obvious and not…It took a few tries before the minors clicked with me. I had read about the use of different bones, but since I don’t handle those on a regular basis (or, like, ever! ), I had to constantly look at the cards titles to recognize the suit. 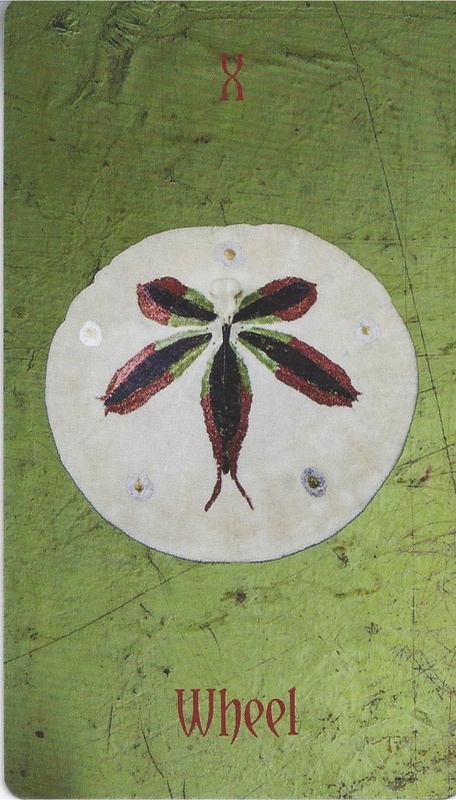 But…After leafing through the deck multiple times, doing several spreads, all of a sudden the lightbulb came on. The Minor Arcana gave away its secrets. I could spoil the fun and tell you which shapes to look for, but I am pretty sure this process will help you bond with the deck. Once you realize which kind of bone is used, each choice for the suits in this deck will start to make sense. 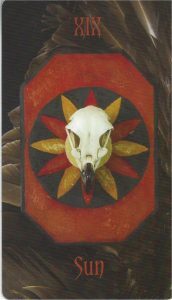 The Tarot of Bones can also easily be read in exactly the same way you read other pip-decks. Simply by using the arrangements and integrating those visual clues into your answer. The earlier mentioned 6 of Cups gave me ‘safety’ in my personal reading (funnily enough also mentioned in the companion), but I came up with the alternative ‘stable romance’ as well. 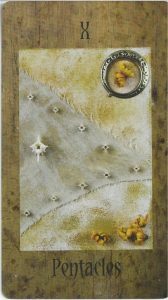 That means this deck works with existing WCS knowledge, plus adds to your array of tarot meanings in the process. The courts and a lot of the Majors consist largely of certain animal skulls and those still give me pause sometimes. 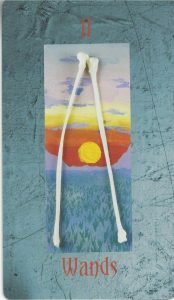 It emphasizes the fact the Tarot of Bones needs your undivided attention if you are unfamiliar with casting lots and skulls. Though, with every question this deck gave me, the answers followed suit eventually. This deck is consistent and logical. 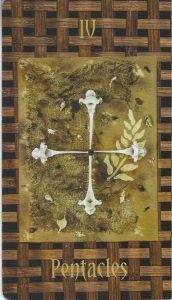 And if you need some help at first, there’s always that companion and the website on Tarot of Bones. So far the Tarot of Bones was unexpected. In a good way.When it comes to tarot art, there’s always a slippery slope between taste and an objective, general measuring rod. So, where my issue with the art-choice lands…I’ll leave that up to you. All the assemblages hold a multitude of natural elements. 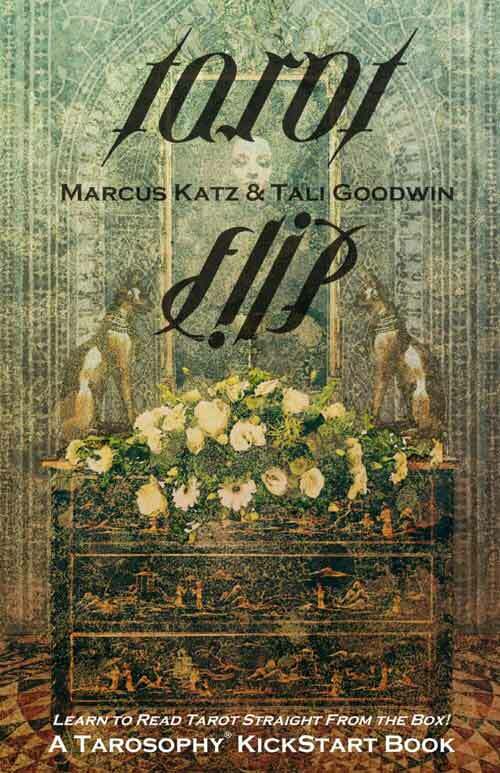 The arrangements are interesting, well-thought out and most of them are certainly pretty. 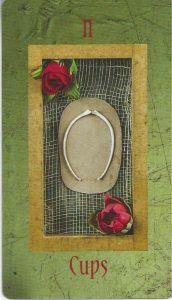 Not everyone likes photographs or collages in their tarot, but the Tarot of Bones is so different it could have persuaded readers to try it out. And at least the effort put in, is obvious. So, what is my issue then? Well, that is the fact that every assemblage on the final product is very small. 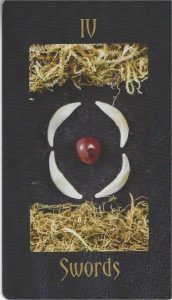 The part I am supposed to divine with and use in my readings – the arrangement of bones and natural materials – only takes up 1/2 of the card. The rest of the card is ‘eaten up’ by all the different, very large, backgrounds. Only a few form a fluent whole (like in the Majors, f.e. The Lovers, The Wheel and Tower). 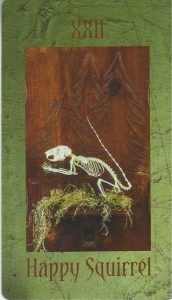 The Tarot of Bones also has a little surprise – something that more designers do lately: a Happy Squirrel card. I haven’t used it in my test readings, but you can do whatever you like (and in this case it is maybe a not-so-happy squirrel?). Regardless of what I think of the art-choices, the Tarot of Bones is unlike any other deck I’ve encountered. Now, I am nowhere near 80 years old and my collection is quite possibly still dwarfed by many or yours, but I know original when I see it. Even when it contains elements that aren’t new, like a combination of divination techniques. An oracle would have been the expected choice, instead she used the structure of tarot. She remade the archetypes – as many like to call the Majors – into new images. She also gave each suit card new value. Their nature and assembly adds meaning to existing WCS vocabulary. Lupa tried to go beyond the ‘theme’. 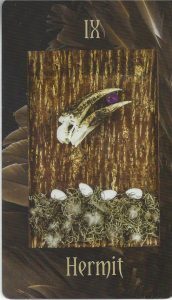 Whether you love what she did with those bone collages or are still on the fence, they are more than just pretty natural things thrown together. The card stock is a bit of a disappointment, but luckily still acceptable. The deck isn’t for beginners, but the fact you can easily apply pip-techniques makes it less difficult than anticipated. 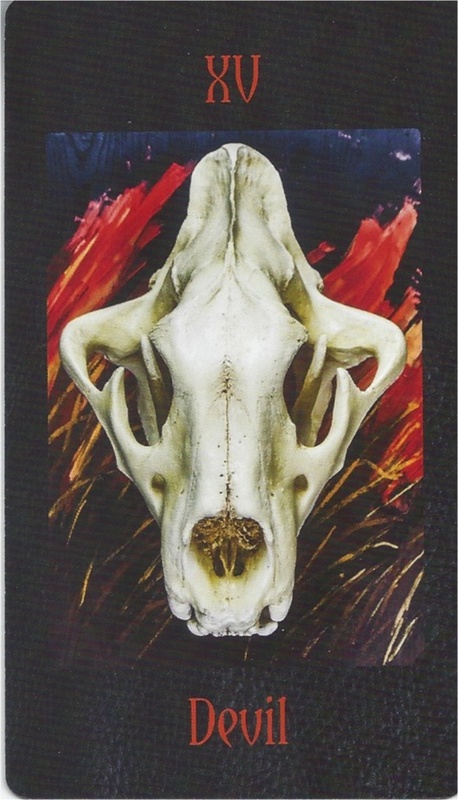 Add the wonderful Tarot of Bones companion to that and you have a tarot deck that will for sure be an asset to every tarot reader who connects better to nature than to human symbols. No animals were hurt in the process of writing this review. 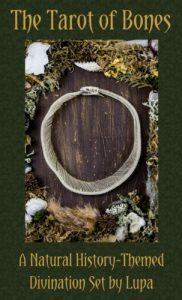 Check out the rest of her website too, it is a wealth of information on the construction of the deck and everything else you might want to now about Tarot of Bones and its creator.